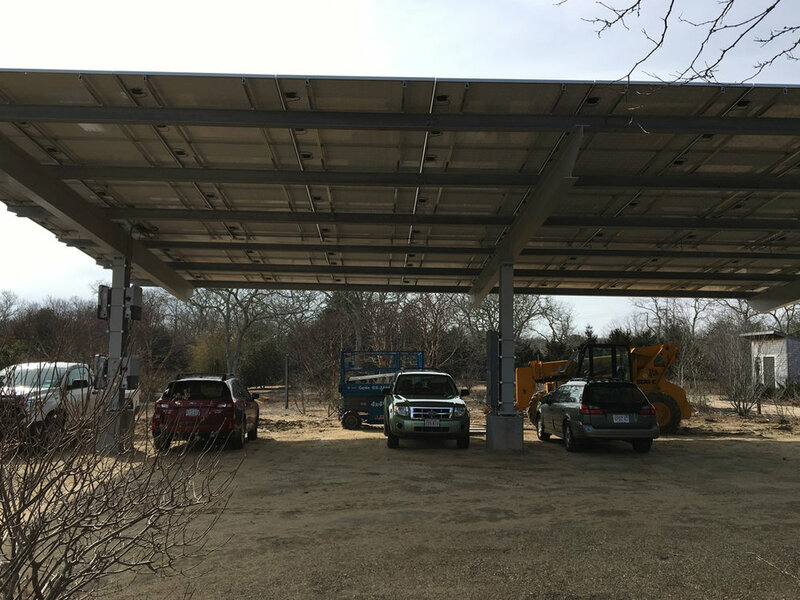 Vineyard Gardens production facility in West Tisbury is in the final stages of installing a parking canopy complete with solar arrays. As an avid environmentalist the goal to source alternative energy for Vineyard Gardens has been a long held objective for co-owner Chuck Wiley. Now that the technology has become more readily available and the concern for climate change has heightened, Chuck knew it was time to make this happen. Chuck built Vineyard Gardens from a summer seasonal landscape business service back in the 80’s to one of the largest and most respected Landscape/Garden Centers on Island. He was an early adopter of recycling, composting and natural gardening methods. To achieve his objective of an alternative energy source Chuck teamed up with John Guadagno and Rob Meyers at South Mountain Co. The folks at South Mountain have been involved in environmental design and development here on the Island for decades. Chuck felt they were the best choice to head this project because of their reputation as well as a desire to stick with a local company, who would be readily available if something should arise. He explains, “As far as the environmental impact, the only arbiter was the town and South Mountain knew what to do, what to say and what to ask for." This project had a lot of people working on it, South Mountain, Brissette Electric, Keene Bros. and various other subs. The cost of the project is $272,000 dollars. Chuck explained, “I applied for a $20 thousand dollar Rural Energy for America Program Grant from the USDA. I spent an incredible amount of time trying to get it.” Holding up a file folder more than an inch thick of paperwork he states “This is my USDA file. They accepted my application but they haven’t given me any money yet. They wanted everything. I had to show that it wasn’t on an anthropological site, didn’t have an Indian Burial Ground. I had to show them all my math and that there were no better, cost effective alternatives. They wanted an environmental review and so on.” He explains how he did not realize what an undertaking it would be to apply for this yet he says, “I could have done this project without all this paperwork, but the reason this project makes sense is that there are government incentives. If I were to have to pay for this without the incentives the payback period would be much longer and would not make as much sense.” He goes on to say that he was able to get a loan from Cape Cod 5 who has done previous loans for solar arrays and that in ten years, in theory, this project should pay for itself. Overall Chuck says, “This is a good thing for me because it’s paying for itself but just the thought of doing anything that will cut down on our coal, oil or gas usage is huge to me. This has been a very important part of my life.” As far as maintenance goes, “It's near zero. There are some electrical components that may have to be replaced after twenty plus years, but for the most part its supposedly maintenance free. I’d love to see millions of these across the world. As long as they could pay for themselves, I don’t know why you wouldn’t do it And if we create enough of them maybe we won’t need those other forms of energy.” Ultimately he is extremely happy with his decision and recommends it 100%!